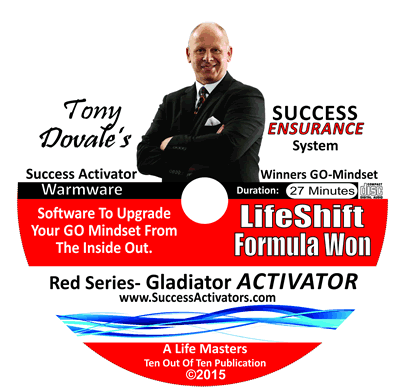 Taming Tigers and Shifting Souls - Success Activators -Get a MINDSMART GO-Mindset! Secret LifeShifting Power of Courageous Growth Mindsets to ENSURE Success. The challenge many people have is that their internal incessant self-talk is undirected, uncontrolled and unhelpful. and this smashes their chances of ENSURING greatest Success. Because our internal chatter, is so constant, we tend to push the incessant yapping into the background, into our unconscious. When we do this, we become unaware of its stream of thousands of questions, comments, and statements, that affect, and infect, our thinking, feelings. moods and actions. This directly impacts our thinking, feeling, happiness, moods and results. If you are not as “successful” as you would like, yet, I can almost guarantee that the core problem that has been blocking your achievement and success, lies internally, with your contradictory, destructive, uncertainty-creating self-talk. When I ACTIVATE / GO-coach with my participants, they often struggle to become fully conscious of the assortment of internal conversations, comments and streams of internal self-questioning and judging. What we don’t seem to understand is the amount of internal mental processing power and energy that get consumed by this contestant stream of story. What The Self Help Guru’s Never Teach You! After 40 years of research, development and experience, I have discovered the CORE truth of why most people struggle to create any reasonable level of sustained positive success. The very foundation of true success begins with stopping the internal conflicts of beliefs, values, expectation and judgments. With 100% certainty, I can assure you that unless you effectively resolve this area of your Growth-oriented Mindset’s foundation, you will NEVER create sustained and joy-filled success. From the feedback from the thousands of people who have had life-shifting experiences with my Life Masters Personal Transformation LifeShift process, this is the NO#1 area that was the hardest to resolve, but most important and vital for their success. Seldom have I seen anyone deeply change their life, from scanning through some self-help book or material. If I look over my own life, the most powerful personal transformations were enabled in a group action-learning EXPERIENTIAL process. You can read a book on How To Wrestler Tigers… But after reading the book, CAN YOU ACTUALLY REALLY successfully wrestle a tiger? NO! Why? Because you only know ABOUT, wrestling. You don’t know HOW TO WRESTLE…And that is the beginning of the blocks, leaks and self-limiting identity to stop success; Your lack of confidence, Self-Esteem, uncertainty, fear and avoidance. What most people never seem to understand is that your inner landscape, the part that is usually hidden from your conscious mind, controls 99.99% of your choices, decisions, and reactions. Research reveals that your unconscious mind regularly make decisions up to 7 SECONDS BEFORE, your conscious brain has any idea of what it’s reaction will be. So whilst you live thoughtlessly with the incorrect perception and mistaken beliefs, that you consciously control your thoughts etc.. it’s clear.. you DON’T, and have not, for most of your life! Most people, feel in some way, that they are stuck, stalled, stressed or stagnant… This is the beginning of the adventure to get yourself more energised, empowered, focused and moving more freely. So What’s The Best Solution for a Courageous Growth Mindset? • Removes limiting IDENTITY boundaries, reflections and decrees. • Resolves inner cross-linked and conflicting values, visions and destinies. • Rewires your Mindset with a Growth-Oriented CORE. This takes, time, commitment and fierce focus. Many lazy, unsuccessful people, just seem to want a quick-fix, to get them on their way… They don’t appear to be prepared to do the real self –mastery activation process required that will ENSURE true Success. To help those Quick-fix people, here is a start to your Self Mastery Adventure. Start becoming more conscious of your internal chatter. CONSCIOUSLY direct and manage your mindset, self-talk and emotional state to with the following approach. • ONLY allow positive, uplifting self-talk. Use the following questions to keep your mind momentum moving forward and focused on the relevant stuff. By incorporate these questions into your moment-to-moment thinking and reactions, you will uncover more energizing, uplifting and empowering pictures, thoughts and feelings. Use these questions daily and intentionally, instead of your habitual reactions. What’s the most valuable question I can ask right now? What do I really want here and now? What are my possible choices that will TRANSFORM this? What assumptions am I making that are invisible to me right now? What might I be unconsciously avoiding and how can I shift that? What control and RESPONSE-Ability can I create right now? If I shift perspective to other points of view, what more can I see that I’m missing? How can I uncover more? How can I be more grateful for this? What steps make the most sense in creating a win win experience I would be proud of? If I remove all limitations now, what is possible? What is my nest best decision, choice or action? This is just the beginning of your adventure into creating true success in every area of your life. Feel how different and more powerful you will feel. See how your interactions shift with others. Discover how rapidly you can take back control of your GO mindset to ENSURE greater success. If you are ready to transform your life and results surf to www.successactivators.com for a free MINDSET assessment that will help you to uncover your true potential, greatness and Gladiator Grit to ensure true success. I look forward to hearing of your new found energy, power and joy. Please let me know how you go?